Roll up! Roll up! It’s time for another fun game of Which European Giant Is Actually So, So, So Much Worse at Football Than You Would Assume From Looking At Their Squad And Casually Following Their Results? You loved the Real Madrid edition. You stood agog as Atletico Madrid left the Champions League with a whimper earlier in the week. And our latest contestants? A big Warm-Up hand for… Bayern Munich! Good lord, they were bad. Not didn’t-quite-have-enough bad, or even could-possibly-blame-the-ref bad. No, just bleakly, cluelessly bad. Bad bad. They created so little that even using the verb ‘to create’ earlier in this sentence was an act of huge generosity. 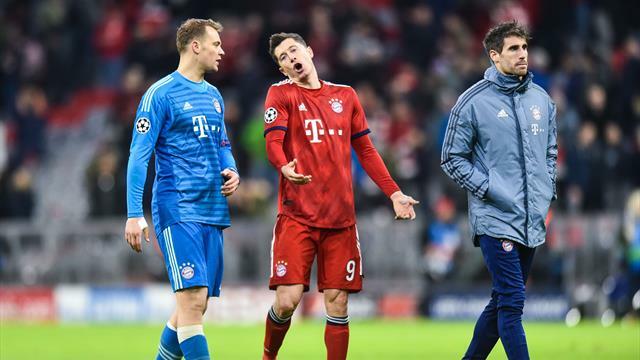 Robert Lewandowski ran around a bit, miles away from the action. Frank Ribery passed backwards. Thiago and Javi Martinez passed sideways, slowly. James Rodriguez basically played in defensive midfield. Niklas Sule wore the faraway look of a man thinking more about his next goat buffet than the task at hand. It was revealing the most pioneering player in red was Renato Sanches – firstly because he was only on the field for 11 minutes, secondly because he’s Renato Sanches, and thirdly because even he wasn’t that good. All in all, it’s been a pretty dark few weeks for the Bundesliga’s best in Europe. Between Bayern, Borussia Dortmund and Schalke, they’ve shipped 17 goals across six games against English sides, managing just three goals in response. Two of those were penalties. The other was scored by Joel Matip. Now what’s the German word (and you can bet there is a word) for ‘time for a good, long look in the mirror, lads’? It’s a full house for the Premier League’s continental contingent, with all four sides now in the hat for Friday’s quarter-final draw. And while Liverpool didn’t need to be anywhere near their best in Bavaria, they still deserve credit for a calm, professional display, graced by fine individual contributions from Sadio Mane and Virgil van Dijk. The one blot on the copy book? A yellow card for Andy Robertson, which means he will be suspended for Liverpool’s next game. And if you just got a shiver of Schaden-ticipation at the thought of Alberto Moreno marking Lionel Messi… well, you’re only human. Somebody should probably check on Kevin Kilbane, because Declan Rice – formerly the Republic of Ireland’s great white hope – is now very much in the England squad. The West Ham man, you may recall, recently switched allegiances to the country of his birth despite having played three times for the Boys in Green, drawing howls of anger from Kilbane and others. And now Gareth Southgate has called on Rice to represent the Three Lions in Euro 2020 qualifiers against the Czech Republic and Montenegro later this month. Or indeed as an inverted traitor, if you ask the amusingly Preston-born Kilbane. It’s far too early to be taking votes for Quote of the Season just yet, but if The Warm-Up encounters a stronger candidate than yesterday’s masterpiece from Unai Emery between now and May… well, then we’ll have a title race better than the actual title race. This just in from our Los Angeles office: Warner Bros are working on a remake of – drum roll please – Escape to Victory. Yes, actually. In common with all Hollywood remakes, it’s the remake you never knew you wanted and certainly don’t need. At the helm is Jaume Collet-Serra, perhaps best known for directing a series of brainless Liam Neeson vehicles over the last decade. So we can probably expect the latter to take on the Sly Stallone role, provided he’s still welcome in the film industry after recent… erm… admissions about his past. Joking! Everyone is always welcome in the film industry, no matter what they’ve done. Yes, Lionel, The Warm-Up sees you, with your two goals and two assists in Barcelona’s 5-1 win over Lyon. But it was Luis Suarez who came up with the moment of the night, turning Brazilian centre-back Marcelo inside-out with a lovely, off-the-cuff dummy just outside his own area. Our eyes! Our poor, innocent, defenceless eyes! "To Schmelzer — who has had to deal with Robben in direct, face-to-face competition more than any other opponent — there is something else, however. He has noticed that Robben has leaned more heavily on his favored move in recent years, using the wing as a decoy to open the path to the center. It still works, though, because he recognizes it when you block his path, and then he reacts accordingly; that is what makes him special." That’s Rory Smith, speaking to three of the most frequent victims of Arjen Robben’s special move, the cut-inside-and-shoot. How he was missed by Bayern last night. And here’s an interview with Gabriel Jesus that definitely, definitely wasn’t written by anyone associated with The Warm-Up. Honest. The Warm-Up has plugged all the figures into our trusty Peril-O-Meter and confirm that tonight’s Europa League round of 32 second legs contain – oooh! – a good 23.4% more peril for the big teams than expected. So while Napoli and Chelsea are pretty much through, there’s a decent chance that Arsenal, Internazionale, Sevilla, Benfica and Valencia will be dumped out of the competition in circumstances we’re going to go right ahead and call vaguely amusing. Don’t let us down, underdogs!